Add Sterling Silver Personalized Name Charms? This pendant is an adaption of the last two lines of the beautiful children's book above. A wonderful sentiment for a loved one, or a reminder of childhood. 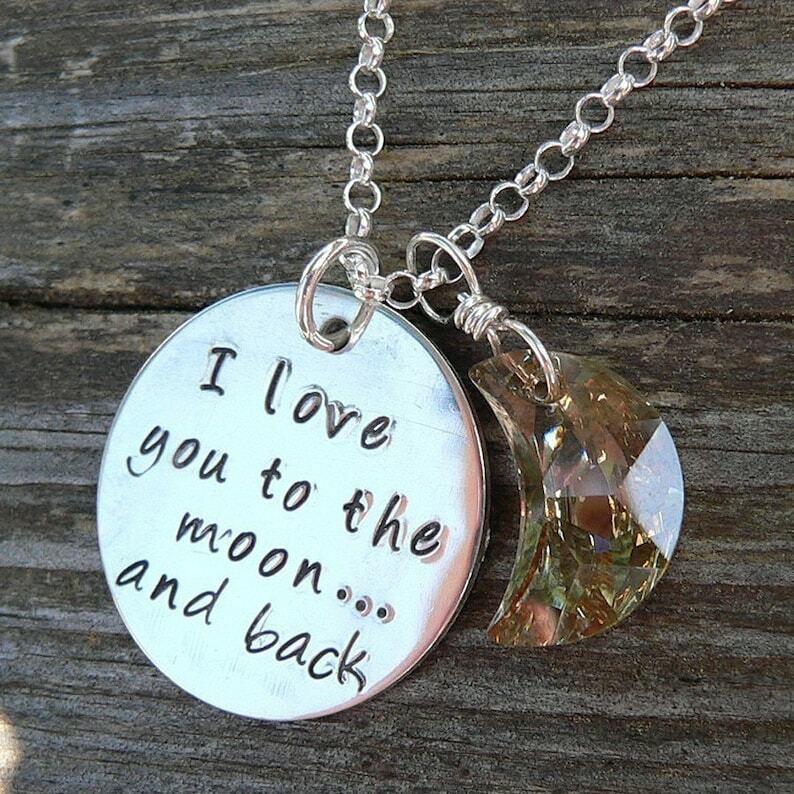 Hand-forged and stamped sterling silver, with a Swarovski Crystal moon (the default is the golden color you see here. I do have crystal clear as well, just let me know). You may choose if you'd like any personalized tags, and how many. Let me know the names and dates (or what you wish stamped) on them in the comments to seller - or just email me, bonnie [!at] birthdesigns.com. Suspended from a sterling rolo chain, the pendant and the moon are independent from one another and move separately. On your neck, the moon partially covers the pendant. The pendant is about 1" diameter. If chosen, the personalized tags are about 3/4" in diameter. You may also choose to have Swarovski crystal birthstones. If so, please let me know which stones (or months) you'd like. You may choose your necklace length - 16", 18", 20" or 24". If none is indicated, an 18" necklace will be sent.